Yesterday I did my first attempt and still waiting for the result but I know i will fail for sure. Once I got the Cisco questionnaire…I was in double mind..should i start now or read all question…and I wasted more then 1 hours on this. There are many question or sub-question in exam. and that was too tricky to handle it. Even i did not understand the real question after reading many times. Now we can think of the CCIE level. Now again will start my journey, track my progress status after that will book my LAB again. @Update_02.02.2015: Today I got a confirmation mail and the word they wrote as “failed“. In this post we will learn/test how the dynamic VLAN assignment works. 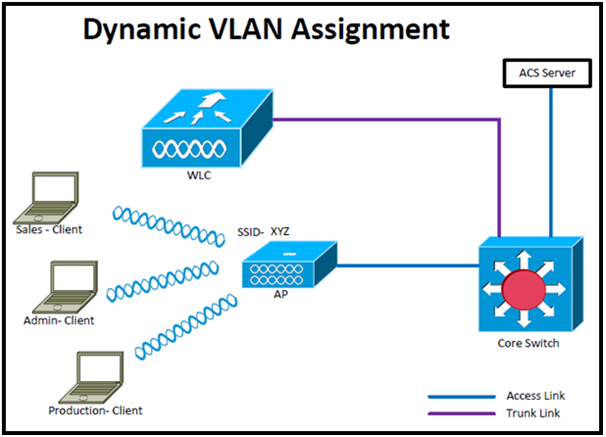 Dynamic VLAN assignment: It pushes a wireless user into a specific VLAN based on his identity. 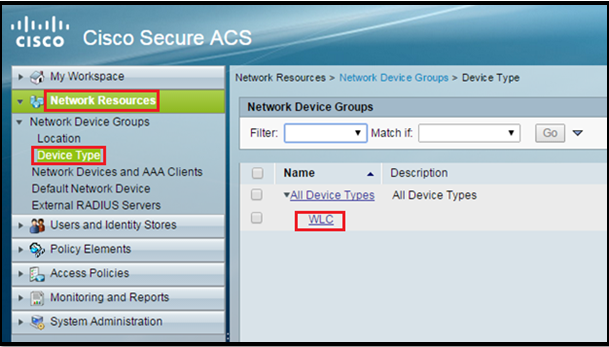 This task of assigning users to a specific VLAN is handled by a RADIUS authentication server (i.e. ACS). It’s a type of identity networking. It allows us to have single SSID, but allows specific users to use different VLAN attributes based on the user credentials. 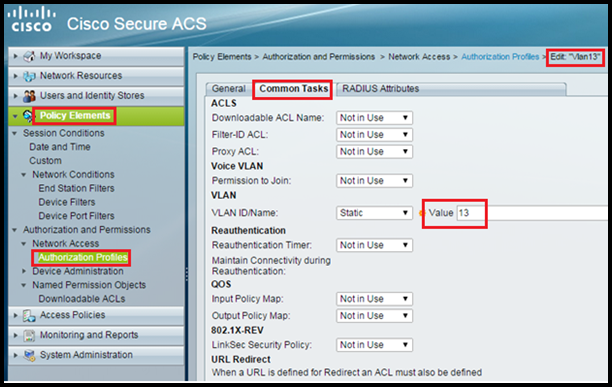 This task of assigning users to a specific VLAN is handled by a RADIUS authentication server (ACS 5.2 in my case). 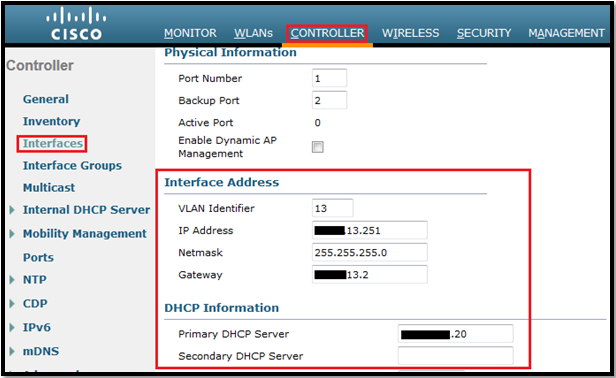 This can be used, for example, to allow the wireless host to remain on the same VLAN as it moves within a campus network. As a result, when a client attempts to associate to a LAP registered with a controller, the LAP passes the credentials of the user to the RADIUS server for validation. Once the authentication is successful, the RADIUS server passes (IETF) attributes to the user. 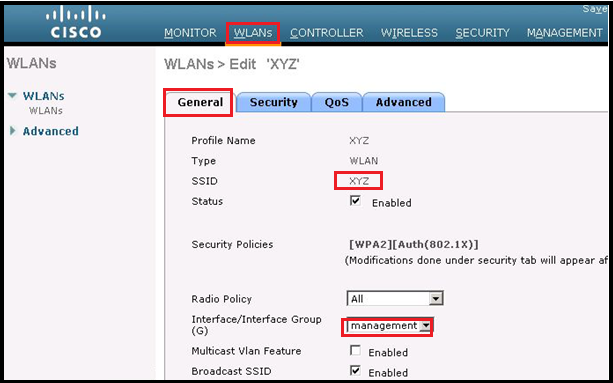 These RADIUS attributes decide the VLAN ID that should be assigned to the wireless client. 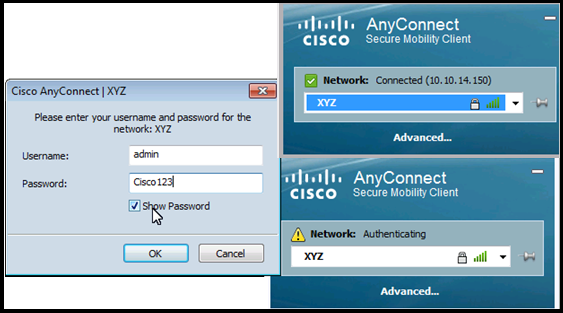 We will create a SSID “XYZ” and assign a non-routed VLAN (99) or management VLAN to it. Now we have Groups of employees in our company “Production, Admin and Sales”. 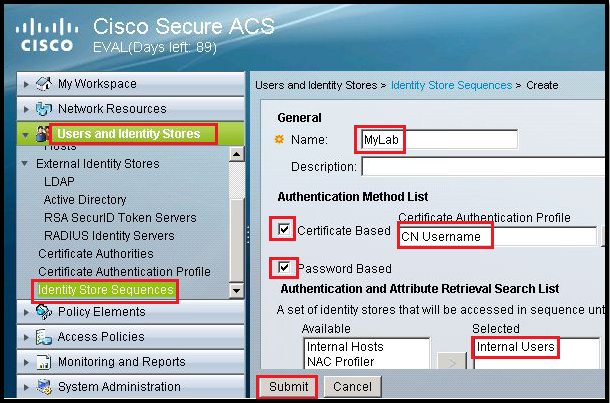 We must configure the WLC so it can communicate with the RADIUS server in order to authenticate the clients. First we will add the WLC as an AAA client on the RADIUS server so that the WLC can pass the user credentials to the RADIUS server. Enter the Name (MySSID), choose Dictionary as RADIUS-IETF and Attribute as Called-Station-ID. 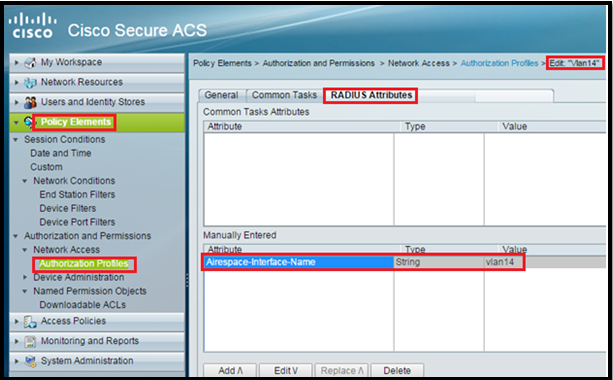 Go to Policy Elements > Authorization and Permissions > Network Access > Authorization Profiles > Create. 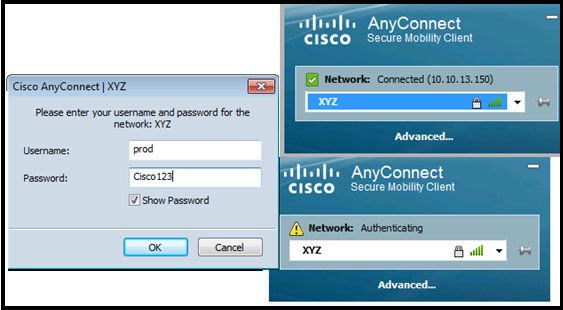 IN this post we are using vlan 13, 14 and 17 so we need three Auth Profiles. Both ways are shown here. 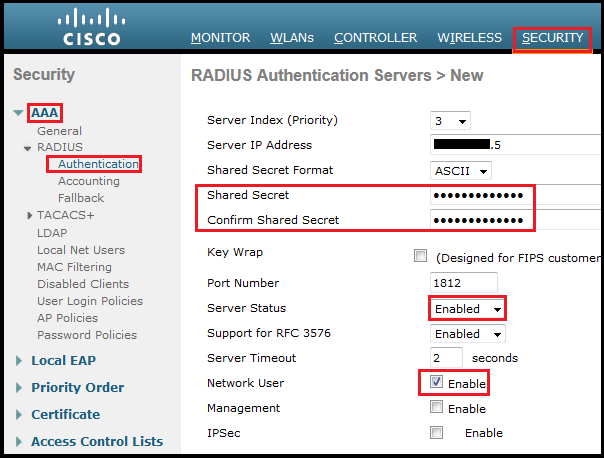 We are using Radius Authentication we have to use Default Network Access. 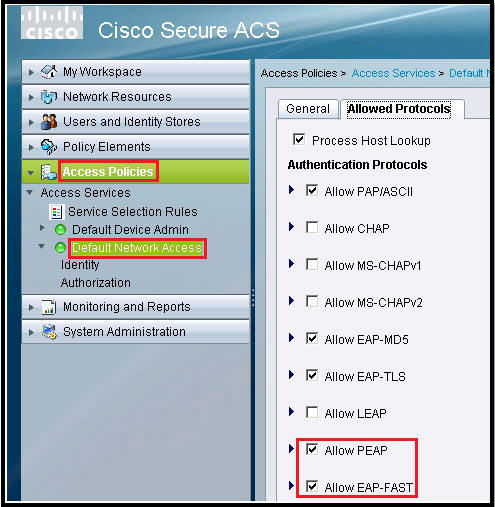 Select which EAP method we would like the wireless Clients to Authenticate. In this post we will use EAP-FAST or PEAP. Select Identity under Default Network Access as “MyLab” which we created earlier. 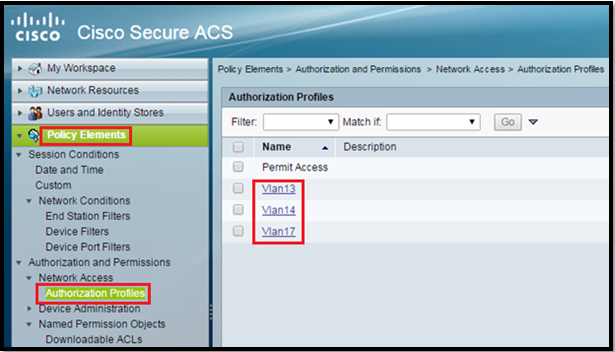 Go to Access Policies > Access Services > Default Network Access > Authorization. We can customize under what conditions we will allow user access to the network and what authorization profile (attributes) we will pass once authenticated. 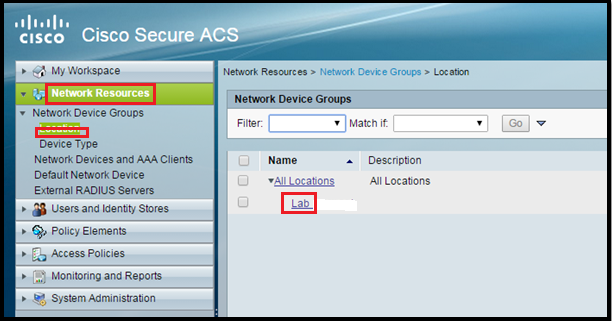 In this post, we selected Location, SSID, Device Type, and Identity Group. Production User must go in vlan 13. Sales User must go in vlan 17. Admin User must go in vlan 14. In this post we wills learn about Client Link (Beam forming). As we all know that 802.11n provides remarkable performance improvements in the areas of throughput, link reliability, and predictability. The transition to 802.11n provides significant benefits, but most organizations will take a phased approach to migration. In the coming days/month/Year, many installations can be expected to support a mix of older 802.11a/g clients and newer 802.11n clients. The reasons that older clients will continue to operate for some time is that it takes few years for a full refresh cycle of enterprise laptops. And certain industries such as manufacturing and healthcare can take even longer to replace their devices. In mixed environments, older 802.11a/g clients delay communications for 802.11n clients and reduce system performance. That’s y Cisco has developed a new technology that allows businesses to deliver the performance benefits of 802.11n to 802.11a/g devices, thereby increasing their useful life. Client-Link is a spatial-filtering mechanism used at a transmitter to improve the received signal power or signal-to-noise (SNR) ratio at an intended receiver (client). Cisco Client-Link ensures our mixed 802.11a/g and 802.11n devices operate at the best possible data rates on our wireless networks. Cisco Aironet 1140, 1250, 1260, 1600, 2600, 2700, 3500 and 3600 series access points support Client-Link. Client-Link uses multiple transmit antennas to focus transmissions in the direction of an 802.11a or 802.11g client, which increases the downlink SNR and the data rate to the client, reduces coverage holes, and enhances overall system performance. Client-Link works with all existing 802.11a and 802.11g clients. 11b clients do not support Client-Link. The access point actively maintains Client-Link data for up to 15 clients per radio. Client-Link is supported only for legacy orthogonal frequency-division multiplexing (OFDM) data rates (6, 9, 12, 18, 24, 36, 48, and 54 Mbps). Client-Link is not supported for complementary code keying (CCK) data rates (1, 2, 5.5, and 11 Mbps). Only access points that support 802.11n can use Client-Link. Two or more antennas must be enabled for transmission. OFDM data rates must be enabled. 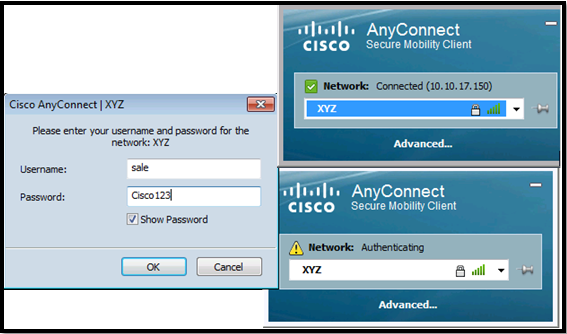 Select the Client-Link check box to globally enable Client-Link on 802.11a or 802.11g network. Click Apply to commit changes. The default value is disabled. Under the 11n Parameters section, select the Client-Link check box to enable Client-Link for this AP. Coverage holes are areas where clients can’t receive a signal from the wireless network. 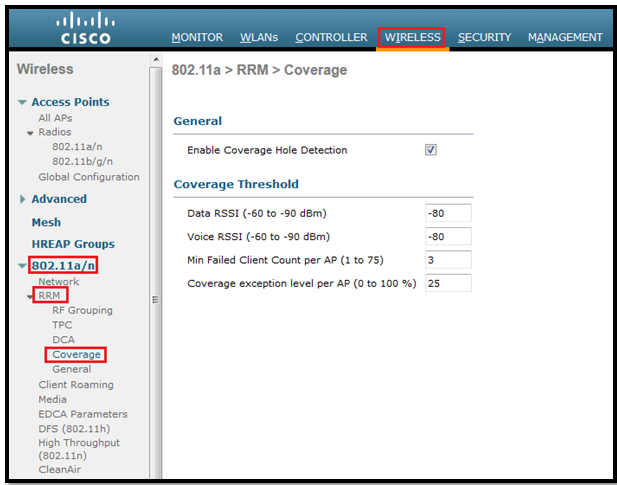 If clients on an AP are detected at low received signal strength indicator levels, Cisco lightweight APs send a coverage hole alarm to the cisco WCS/NCS or PI. 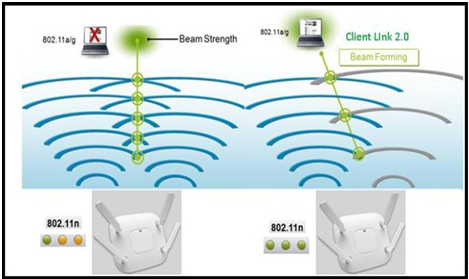 The RRM coverage hole detection algorithm can detect areas of radio coverage in a wireless LAN that are below the level needed for robust radio performance. This feature can alert us to the need for an additional (or relocation) lightweight access point. If clients on a lightweight access point are detected at threshold levels lower than those specified in the RRM configuration, the access point sends a “coverage hole” alert to the controller. The alert indicates the existence of an area where clients are continually experiencing poor signal coverage, without having a viable access point to which to roam. The controller uses the quality of client signal levels reported by the APs to determine if the power level of that AP needs to be increased. Coverage hole detection is controller independent, so the RF group leader is not involved in those calculations. The controller knows how many clients are associated with a particular AP and what the signal-to-noise ratio (SNR) values are for each client. If a client SNR drops below the configured threshold value on the controller, the AP increases its power level to try to compensate for the client. The SNR threshold is based on the transmit power of the AP and the coverage profile settings on the controller. Depending on the number of clients that are at or below this value for longer than 60 seconds, coverage hole correction might be triggered, and the AP could increase its power level to try to remove the SNR violation. If the AP is already at power level 1, it cannot increase the power any further, and clients at the edge of the cell coverage suffer a performance hit or disassociate altogether if the signal gets weak enough. Aside from a real coverage hole, a client with a poor roaming logic might not roam to another AP as expected and be “sticky.” A sticky client can remain associated with an AP until the SNR is very low and triggers a false coverage hole detection. The coverage hole algorithm also allows the network to heal itself if an AP fails. When a neighbor AP is lost, it increases the power of nearby APs as needed to compensate. Again, the increase in power for an AP is a gradual process, increasing the power one level at a time. Enable Coverage Hole Detection check box to enable coverage hole detection, or unselect it to disable this feature. Data/Voice RSSI text box, enter the minimum receive signal strength indication (RSSI) (It must be between -60 to -90 dBm and can be different for voice and data) value for data/voice packets received by the access point. The value that we enter is used to identify coverage holes within our network. Min Failed Client Count per AP text box, the minimum number of clients on an access point with an RSSI value at or below the data or voice RSSI threshold. The range can be from 1 to 75, and default value is 3. 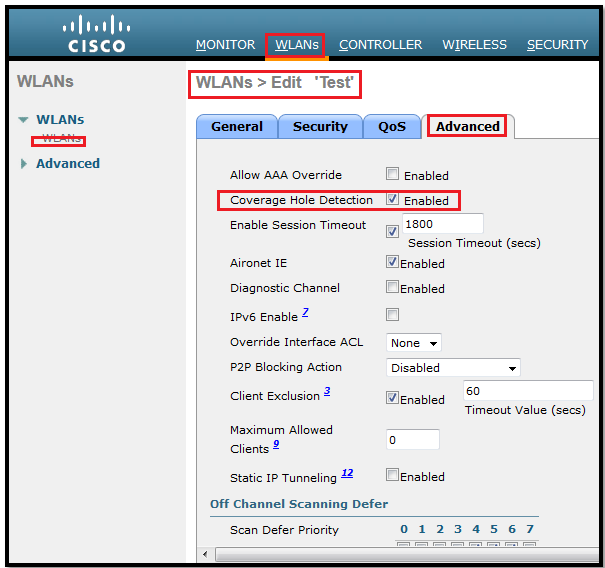 Coverage Exception Level per AP text box, the percentage of clients on an access point that are experiencing a low signal level but cannot roam to another access point. The range is 0 to 100%, and default value is 25%. Note: Coverage hole detection is no longer a global setting and can be enabled or disabled on a per-WLAN basis: Coverage hole detection is enabled by default on the WLAN. One of the reasons we might want to disable this is because if we know a device is going to roam, it is advised that we enable the wireless on the device so that it can assist in finding coverage holes. Conversely, if several devices are stationary and have wireless as a backup, it would be advisable to disable this because we know the devices are not going to move and will not be able to provide intelligent information to help the coverage hole detection algorithm with its calculations. Coverage hole detection is enabled by default on the WLAN. In this post we will learn about DCA and it’s a really cool feature of RRM. DCA used to determine the optimal AP channel based on these parameters. These values are then used by the Group Leader to determine if another channel schema will result in at least a bettering of the worst performing AP by 5dB (SNR) or in other words: Based on these metrics, if the worst performing AP will benefit by at least 5 dB or more, a channel change will take place. The decision to change the channel of an AP is also weighted to prevent a mass change within the RF group. We would not want to have a single AP change channel and have that change result in 20 other APs having to change their channel. The controller also takes into account how heavily an AP is used. A less utilized AP is more likely to have a channel change instead of a heavily used neighbor (isn’t it an interesting feature?). This helps mitigate client disassociations during a DCA event because a radio channel change disconnects all associated clients. ***Note: When an AP first boots up out the box, it transmits on channel 1 on the 802.11b/g radio and channel 36 for the 802.11a radio. The channels change according to any DCA adjustments if necessary. If a reboot occurs, the APs remain on the same channel they were using before the reboot until a DCA event occurs. If an AP is on channel 152 and reboots, it will continue to use channel 152 when it comes back up. ***Note: Radios using 40-MHz channels in the 2.4-GHz band or or 80MHz channels are not supported by DCA. In a single-controller environment, the RRM startup mode is invoked after the controller is rebooted. In a multiple-controller environment, the RRM startup mode is invoked after an RF Group leader is elected. There is three type of Channel Assignment Method. Automatic: This mode will cause the controller to periodically evaluate and, if necessary, update the channel assignment for all joined access points. Freeze: It will Causes the controller to evaluate and update the channel assignment for all joined access points, but only when we click Invoke Channel Update Once. OFF: Turns off DCA and sets all access point radios to the first channel of the band. Avoid Foreign AP Interference: It detect foreign AP and take into consideration while changing the channel. 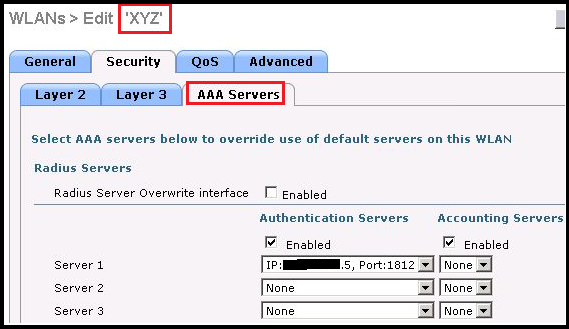 Avoid Cisco AP Load: When its enabled then the AP load is taken into account before result in which AP will change the channel (least loaded AP will change the channel first. 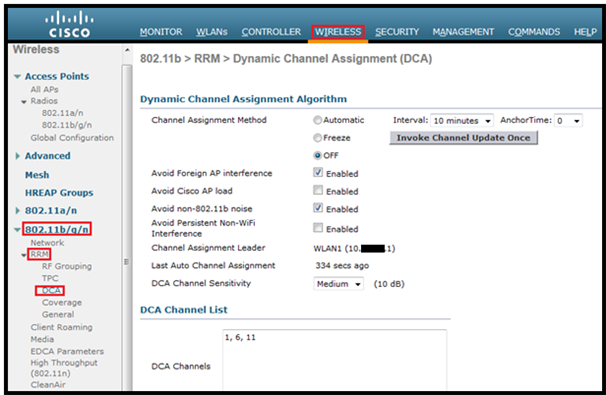 Avoid Non-802.11a (802.11b) Noise: It cause the controller’s RRM algorithms to consider noise (non-802.11 traffic) in the channel when assigning channels to lightweight access points. Avoid Persistent Non-Wi-Fi Interference: Its enable the controller to ignore or avoid from persistent non-Wi-Fi interference. Channel Assignment Leader: The IP address of the RF group leader, which is fully responsible for channel assignment. Last Auto Channel Assignment: The last time RRM evaluated the current channel assignments. Channel Width: depends on the 802.11a or b radios: 5GHz select 40MHz. In 2.4 GHz it will be 20MHz. DCA Channel List: This option shows the selected channel on this radio. The RRM feature is also known as Auto-RF or act as a built –in RF engineer in controller, uses the RF information gathered by the APs to make decisions on whether channel assignment or power levels need to be adjusted. In other words: It uses the RF information gathered by the APs to make decisions on whether channel assignment or power levels need to be adjusted. Just because the RF environment has changed does not necessarily mean that the controller will change. 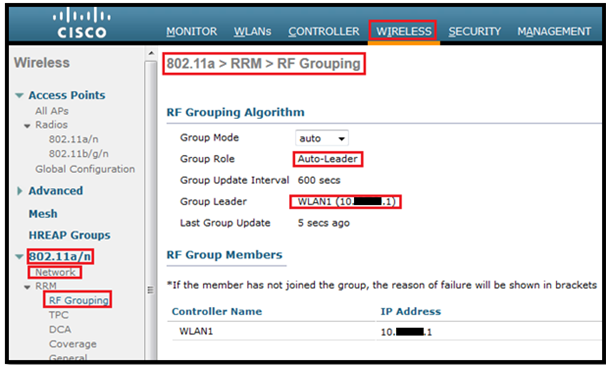 Step 1: The controllers and their APs use the configured RF group name to determine if other APs they hear are part of their RF group. Step 2: The APs use neighbor messages (sent every 60 seconds) that are authenticated by other APs that hear them. The neighbor messages include information about the AP, the controller, and the configured RF group name. Step 3: The APs that hear the neighbor message of another AP authenticate that message using the RF group name and pass it to their respective controller. Step 4: The controllers use this information to determine what other controllers should be in their RF group, and then form logical groups to share the RF information from their respective APs, and elect an RF group leader. Step 5: The RF group leader runs the RRM algorithm against the RF information from all the APs in the RF group. Depending on the outcome, a power level or channel change for an AP or group of APs might take place. 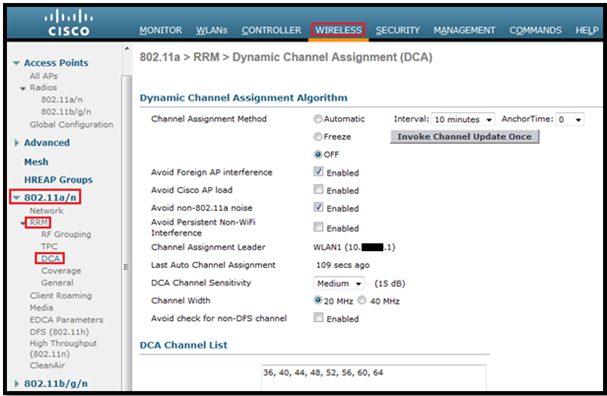 http://www.youtube.com/watch?v=3EnvhxjzEWU – details how RRM controls the AP channel assignment with DCA (Dynamic Channel Assignment). http://www.youtube.com/watch?v=yot63RsKOCg – explains how the Radio Coverage Detection Algorithm works. Traffic load: The total bandwidth used for transmitting and receiving traffic. It enables wireless LAN managers to track and plan network growth ahead of client demand. Interference: The amount of traffic coming from other 802.11 sources. Noise: The amount of non-802.11 traffic that is interfering with the currently assigned channel. Coverage: The received signal strength (RSSI) and signal-to-noise ratio (SNR) for all connected clients. Other: The number of nearby access points. 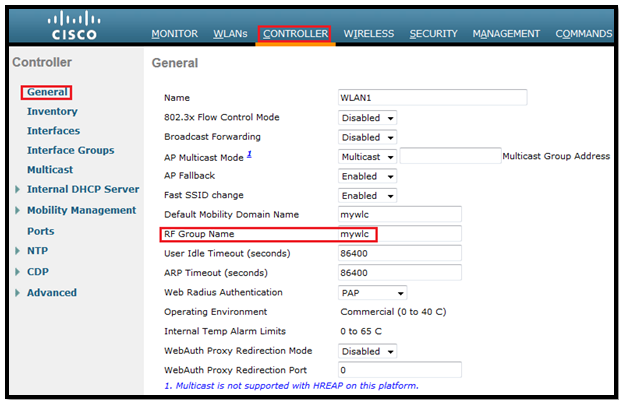 In this post we will see the configuration guide of RRM on WLC. 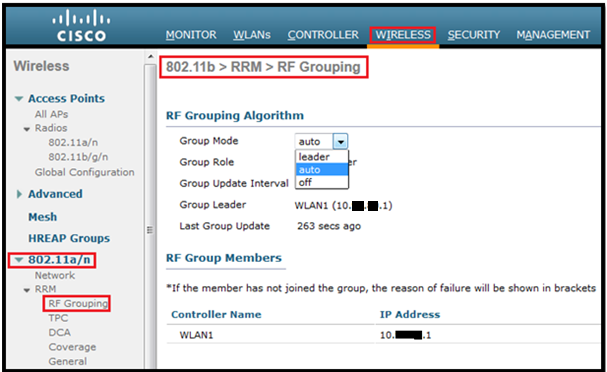 First step to configure RRM is to ensure WLC has the RF Group Name configured. This can be done through the controller web interface. Go to Controller > General and then type a RF Group Name value. (WLAN1) >config advanced 802.11a group-mode ? auto           Sets the 802.11a RF group selection to automatic update mode. leader         Sets the 802.11a RF group selection to static mode, and sets this controller as the group leader. off            Sets the 802.11a RF group selection off. restart        Restarts the 802.11a RF group selection. Group Update Interval: The group update interval value indicates how often the RF Grouping algorithm is run and it cannot be modified. Group Leader: This field displays the IP Address of the WLC that is currently the RF Group Leader. Last Group Update: The RF Grouping algorithm runs every 600 seconds (10 minutes). This field indicates the time (in seconds) since the algorithm last ran. *** A configured static leader cannot become a member of another controller until its mode is set to “auto”. No we will change the Group mode on Controller”WLAN1” as leader. * indicates member has not joined the group. All WLC members must have the same mobility and RF group name. All WLCs AP must be in the range of each other. In next post we will learn TPC, DCA and CHD.